Measure: 52 x 46 x 180 cm. 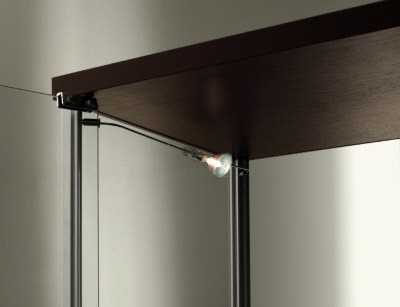 4 shelves (adjustable in height) on rod system for integrated lightening ,sliding door. Showcases are in a „whole-glass-construction“. The showcases are made of high quality glass. You have the possibility to choose between many base- and top-colours. The showcases are easy to mount and dismount. They will be delivered as constructions sets. The showcases are not dust-proof. You can optimal use the showcase to present model cars, jewellery, figures or other collections. The glass cabinets can be upgraded with lightening on sides and shiftrails, therefore you can order more inner shelves. The showcases can be ordered with wood- or glass-roof. Lightening on top is just in connection with the wood woof possible. The glass cabinets are lockable. Our glass showcases are available with swinging or sliding doors. We have sold these showcases to many collectors in the past. The inner shelves have a carrying capacity of 40 kg.